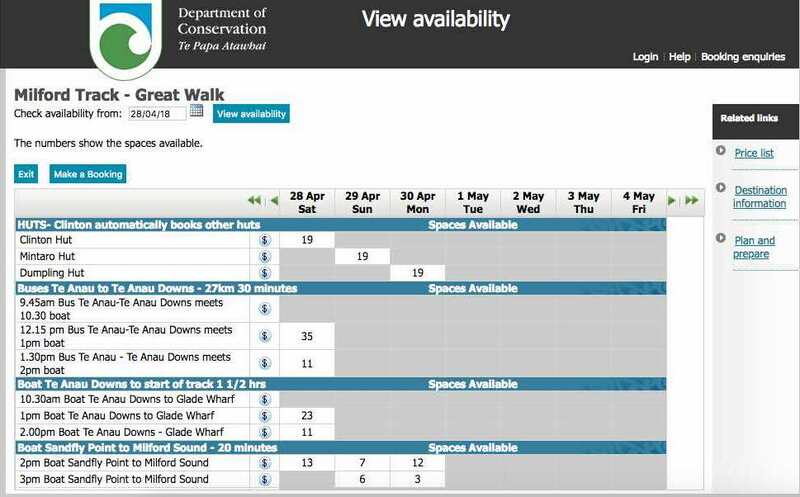 The first step in planning your Milford Track adventure is to select the dates you’d like to hike. 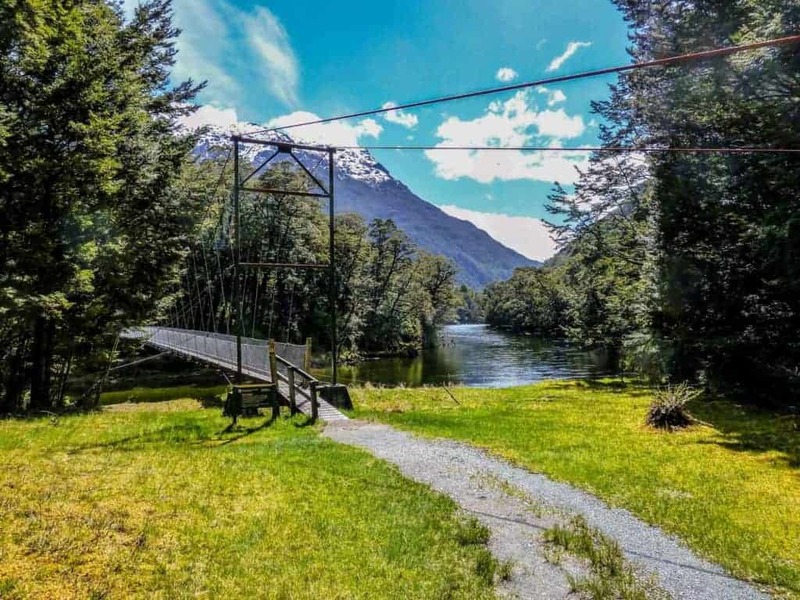 The Track takes four days to complete, and you’ll likely want to plan on spending at least one night in Te Anau before starting and another after finishing the trek . This means you’ll want to allot around six days, minimum. 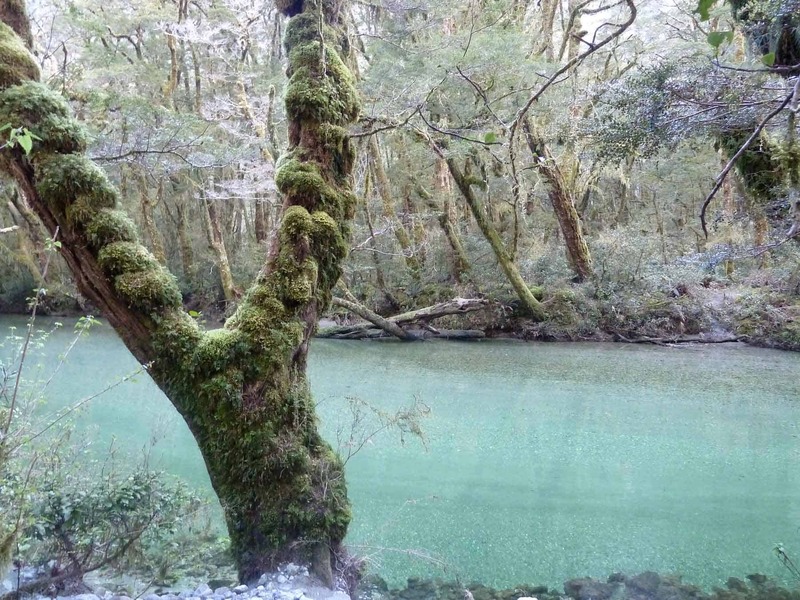 The Great Walk season for the Milford Track runs from late-October to late-April. During this period, the track is highly regulated, with booking required for all huts, and full-time wardens managing each of the three huts on the track. You’ll find the fewest crowds near the beginning and end of the season, although the weather can be much more unpredictable during these times. Many feel that March and April are the best time to walk the Milford Track, as the summer crowds have slowed and the weather remains fairly warm. Once you’ve decided on your dates, it’s time to reserve the three huts you’ll be staying at along the way. 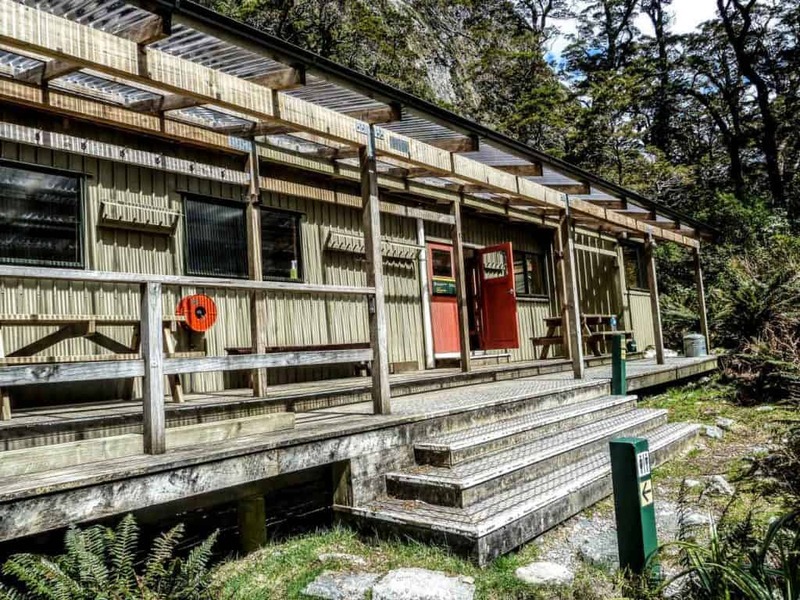 You must have a reservation for each of the three huts along the Milford Route (Clinton Hut, Mintaro Hut, and Dumpling Hut), and you must stay in them on consecutive nights. Each hut sleeps 40 people while also providing communal cooking areas, seating, and common areas. The Department of Conservation manages the hut reservation process, which typically opens on July 1st for the upcoming season. You’ll want to reserve your spots as early as you can since the Milford Track is understandably incredibly popular. The booking process is very straightforward. During this process, you’ll also have the opportunity to book your transport to and from the track, using the DOC system. You can use one account to make reservations for all of the members in your group at the same time. 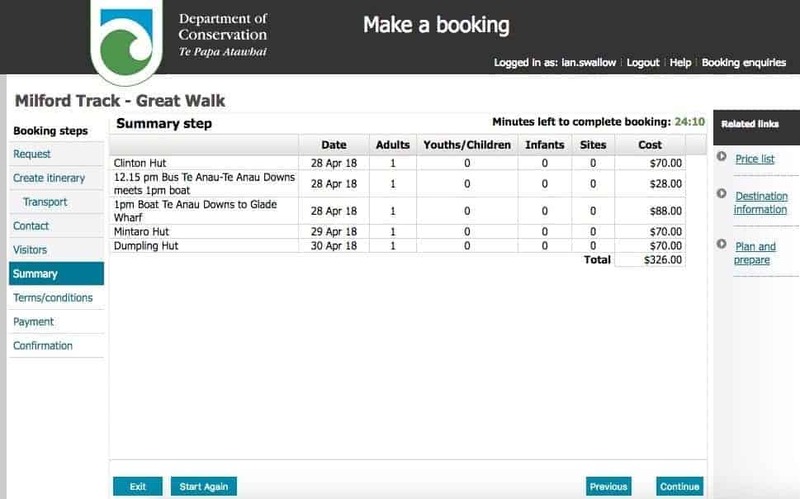 Select the date you would like to start you hike. 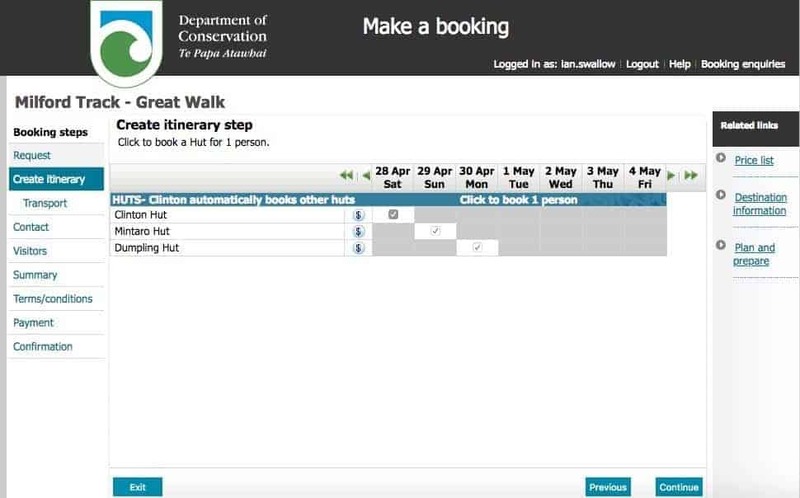 The page will display the number of spaces available in each hut for your selected start date. Additionally, you can scroll down to see the available transport options for the start and finish. You can see how many spaces are available for each night. Next, you’ll select your huts (the system will automatically book all three huts after you’ve selected the first hut) as well as your transport. You are not required to book your transportation to and from the track at this point, but I would highly recommend it! More details below. 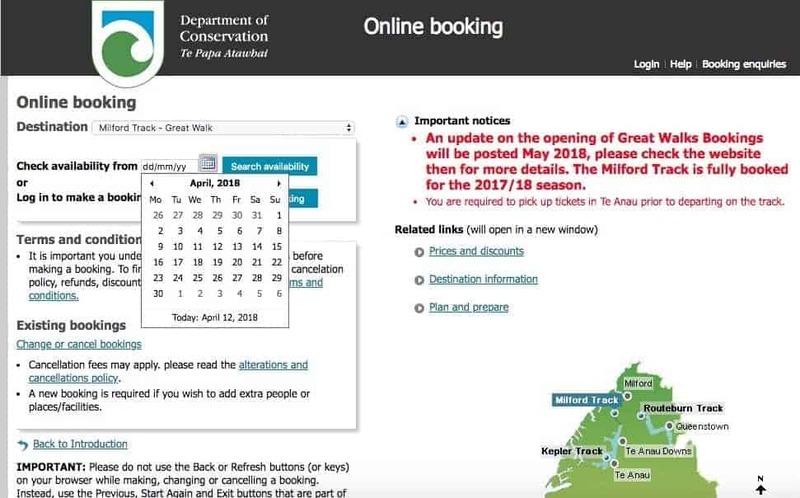 The system will automatically book all three huts on the Milford Track. You can also book your transport to the track while booking your huts. Highly recommended! Next, you’ll verify your contact information and provide some basic information. You’ll then see a summary of your booking along with the total cost (no one said it would be cheap!) This is a good time to triple-check that your dates are correct. Don’t be discouraged by the cost – the trip is well worth it! Finally, you’ll be redirected to the payment page. Enter your payment information and you’ve completed your reservation for the ‘finest walk in the world’! One of my favorite parts about the Milford Track is that both the start and finish are only accessible via boat. There is something special about getting dropped off at Glade Wharf and watching the ferry head back to Te Anau Downs. There is no turning back on your next four days of hiking! 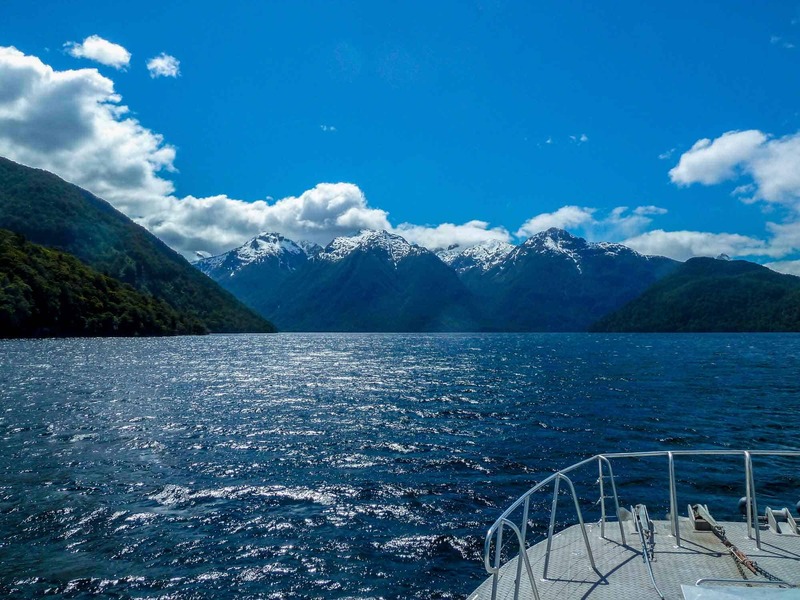 Enjoy the stunning boat ride to the start of the Milford Track! The walk starts at Glade Wharf, which sits at the end of Lake Te Anau, and is reached via a 1.5 hour boat ride from Te Anau Downs (which is little more than a car park and boat dock.) Boats leave Te Anau Downs for Glade Wharf at 10:30am, 1pm, and 2pm. Busses leave the small town of Te Anau for Te Anau downs everyday at 9:45am, 12:15pm, and 1:30pm. It is recommended to stay in Te Anau the night before you begin your trek . The bus ride takes approximately 30 minutes and is timed so that you’ll easily catch a corresponding boat. Note that it is a short, 1-1.5 hour walk from Glade Wharf to the Clinton Hut, where you’ll spend your first night. However you choose to get to the start of the track, enjoy the beautiful scenery surrounding Lake Te Anau and relish in the unique experience of starting one of the most famous walks in the world! The ride from Te Anau Downs to Glade Wharf is a truly unique experience. The Milford Track finishes at Sandfly Point, near the junction of the Arthur River and Milford Sound. From here you’ll have a few options to get to Milford Sound village, and ultimately back to Te Anau. Once again, the easiest method of booking is to do so while reserving your huts. This will ensure you get a ride with the Milford Sound Red Boat, which departs at 2pm and 3:15pm. If you’re feeling adventurous you can also book transport via kayak with Rosco’s Milford Kayaks. If you book your transport while reserving your huts, you’ll be covered for the bus ride back to Te Anau. If not, once you’ve reached Milford Sound village, you’ll have plenty of options for the bus ride back to Te Anau, including all the companies listed in the “Getting to the start of the Trek” segment. The Milford Track (shown on the map above) is a 4-day, 53.5km walk through the heart of Fiordland National Park. Each day is unique, as you’ll experience stunning rainforest, the high-alpine environment of Mackinnon Pass, and some of the most pristine rivers in the world. You’ll begin the first day on the Milford Track on the 1.5 hour boat ride from Te Anau Downs to Glade Wharf. Once you arrive at Glade Wharf, you’ll only have about an hour of hiking to cover the flat, 5-kilometer walk to Clinton Hut, where you’ll spend your first night. This short first day is intentional, since much of your time will be spent simply getting to the start of the Track. You’ll follow the Clinton River for most of this leg of the journey, which includes crossing the river on an impressive swing bridge. Once you’ve arrived at Clinton Hut be sure to claim your favorite bunk and rest up for the longer days ahead. Crossing the Clinton River en route to the Clinton Hut. Clinton Hut provides great common spaces. The second day begins much like the first ended – with a fairly easy walk along the Clinton River. You’ll gain elevation as you make your way towards the Mintaro Hut, passing several waterfalls and getting your first glimpses of the impressive Mackinnon Pass. Finally, you’ll cross Pompolona Creek on swing bridge before arriving at Mintaro Hut at the base of Mackinnon Pass. The walk along the crystal clear Clinton River is stunning! The Mintaro Hut sits at the base of Mackinnon Pass. You’ll waste no time starting the most difficult section of the Milford Track at the start of day three. You’ll spend the first four kilometers ascending steep switchbacks that will ultimately take you to the top of Mackinnon Pass. Once reaching the top, you’ll either be delighted to take in the incredible views, or if the weather is uncooperative, you’ll be hustling down into the next valley as quickly as possible! The climb to the top of Mackinnon Pass is steep, but well worth the effort. Be sure you’ve got a good pair of hiking poles, as the descent from the top of Mackinnon Pass drops steeply nearly 1000 meters. Along the way to Dumpling Hut, be sure and take the sidetrack to Sutherland Falls (an approximately 1.5 hour round-trip detour.) At 580 meters tall, these are the highest falls in New Zealand and quite spectacular. Finally, you’ll arrive at the Dumpling Hut to savor your last night on the Milford Track! 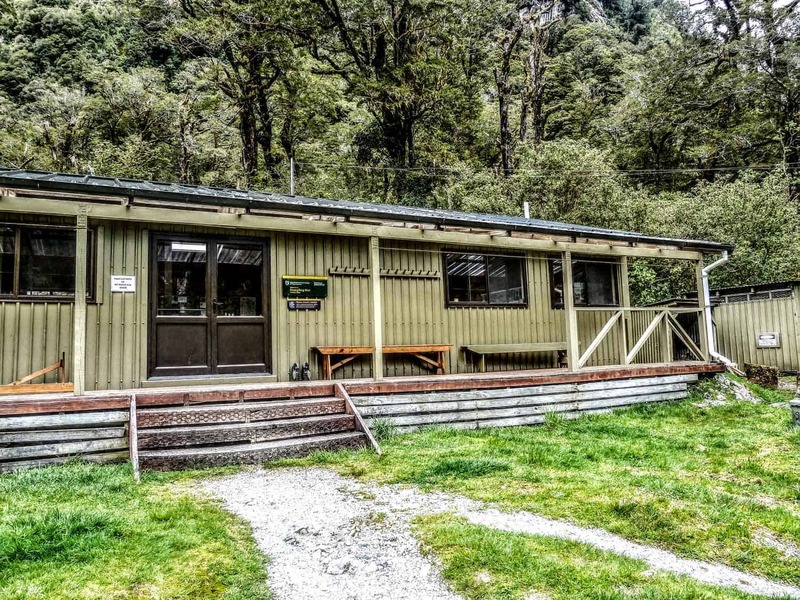 Dumpling Hut will be your home for the final night of the Milford Track. From Dumpling Hut you’ll continue to descend down into the Arthur River valley. 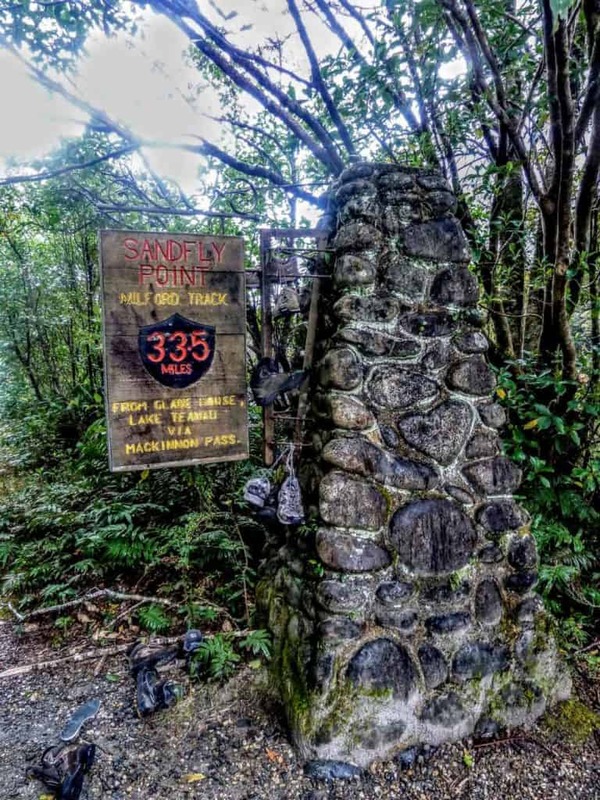 You’ll pass two spectacular waterfalls, Mackay Falls and Giant Gate Falls, before tracing the shoreline of Lake Ada on your way to Sandfly Point. Mackay Falls is a spectacular sight to behold. 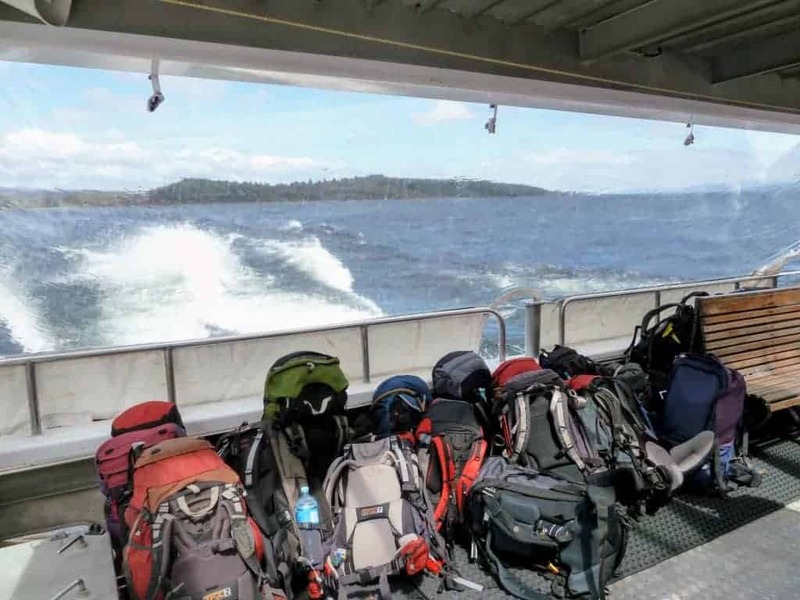 Be sure you’ve allotted enough time to meet your boat at Sandfly Point at the scheduled hour, as you’ll be the least popular hiker on the entire Track if you hold up the boat back to civilization. Finally, enjoy the incredible views of Milford Sound as you cruise back to the dock before catching your bus to Te Anau. 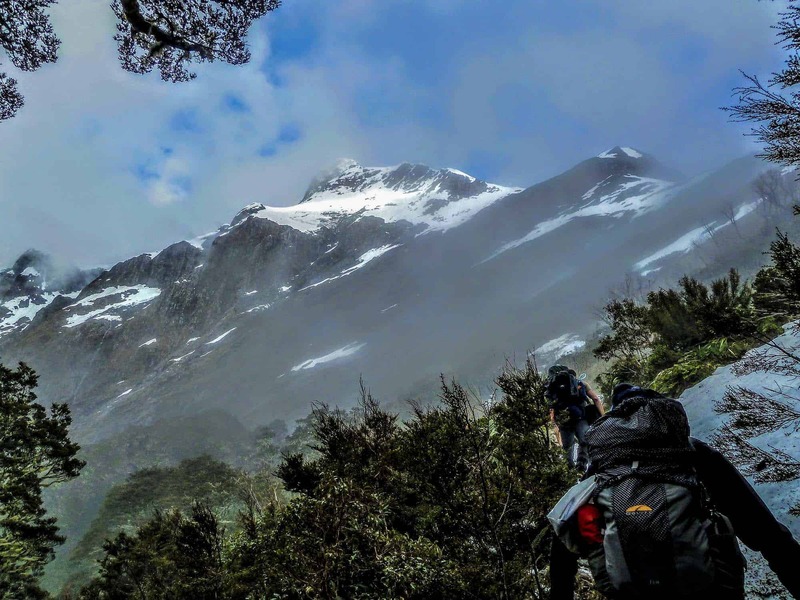 Milford Track Packing List – Be sure you’ve got everything you need! 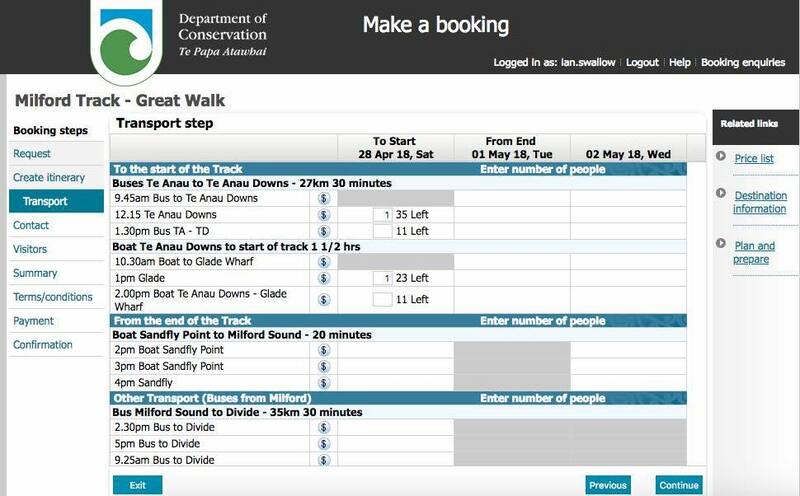 How to Navigate on the Milford Track – Turn your smartphone into a GPS! 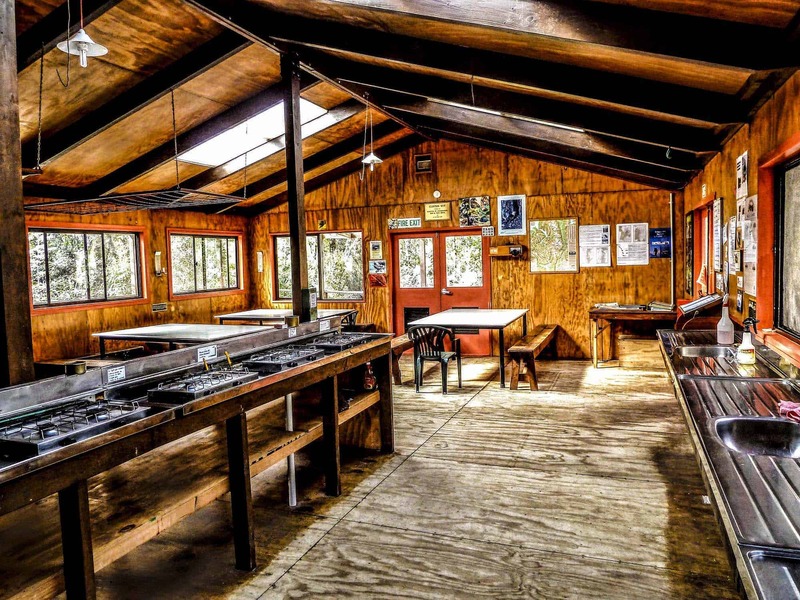 How to find all of your huts on the Milford Track – Know where you are and where you’re going! How to train for the Milford Track – Avoid being the last person to the hut! Milford Track Trip Report – Know what to expect! 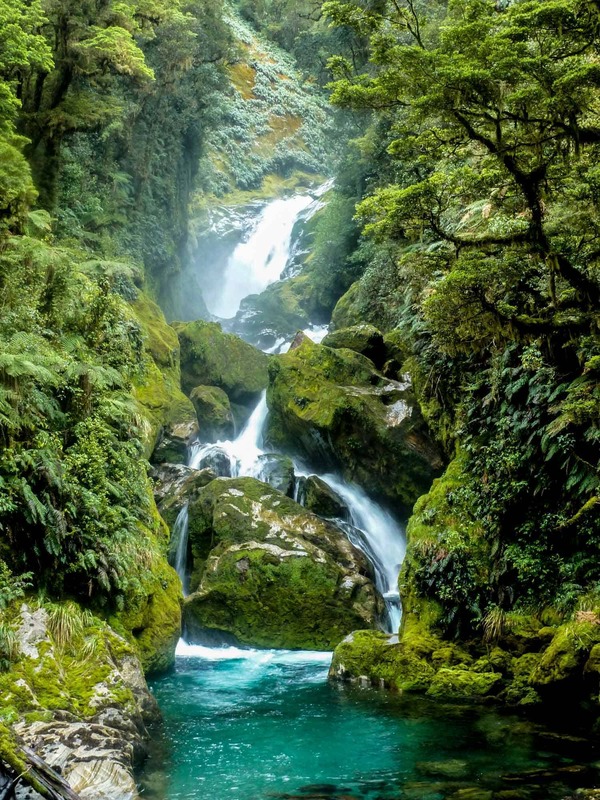 Milford Track Photo Galley – Find some inspiration! Milford Track Shop – Pick up a souvenir, art print, or T-shirt!